This pumpkin icebox cake easy recipe is the taste of Fall in a no bake cake with layers of pumpkin and graham crackers. A great Thanksgiving Day dessert idea! The next few weeks are going to be all about pumpkins, so I thought I may as well jump on the bandwagon. I think of icebox cakes as being desserts for summer, but this Pumpkin Icebox Cake is the perfect Fall sweet treat. It has the freshest pumpkin flavor and is a great make-ahead option for a quick dessert. Both of these good things make it an easy option for a Thanksgiving Day dessert. 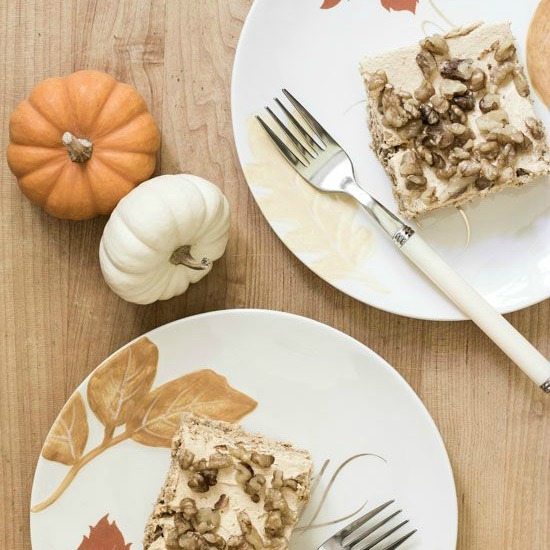 This Pumpkin Icebox Cake recipe could be easily doubled to feed more people. Just switch to a bigger 9 x 13 oblong pan. When I start layering an icebox cake, I’m never really sure how many layers I will get. Keep in mind that if you make your filling layers thicker, you will get fewer layers. That’s not all bad though because the filling is the best part! Pumpkin Icebox Cake Easy Recipe. 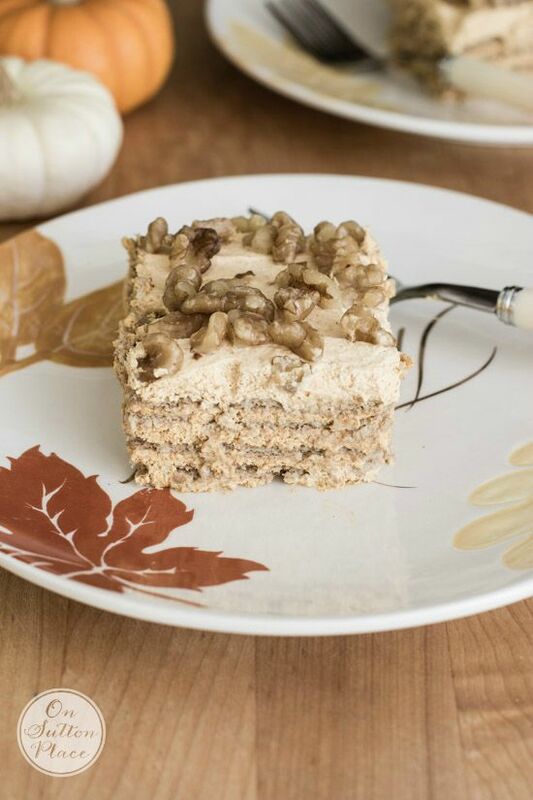 This is the taste of Fall in a no bake cake with layers of pumpkin and graham crackers. Thanksgiving Day dessert idea. In a large mixing bowl, beat together pumpkin and cream cheese until fluffy. Add brown sugar, cinnamon and pumpkin pie spice. Fold in the Cool Whip. It's OK to not use the whole container. Just add the Cool Whip until your mixture is a spreadable consistency. In an 8 x 8 or 9 x 9 pan, spread a layer of the pumpkin mixture. Top with a layer of graham crackers. You will have to break/cut some crackers to make them fit. Follow with alternating layers of the pumpkin mixture and graham crackers, ending with the pumpkin mixture. Top with walnut or pecan pieces if desired. I used a 9 x 9 pan and got 4 layers. If you used an 8 x 8 pan you could possibly get 5. You can switch up the spices in this to suit your taste. 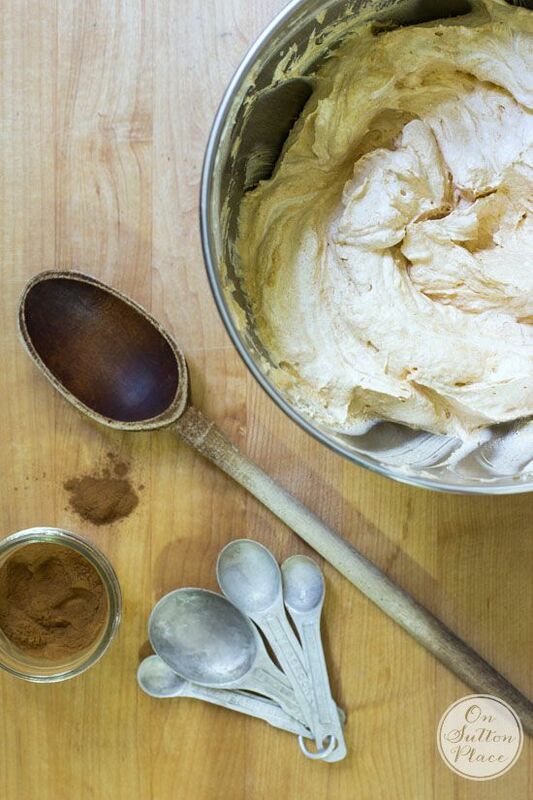 All-spice could be substituted for the pumpkin pie spice…or you could use just cinnamon. If you aren’t a fan of Cool Whip, swap it out for real whipped cream. Keep in mind that real whipped cream isn’t as stable as Cool Whip, so the cake may not last as long in the refrigerator. Chances are you’ll eat it quickly anyway! 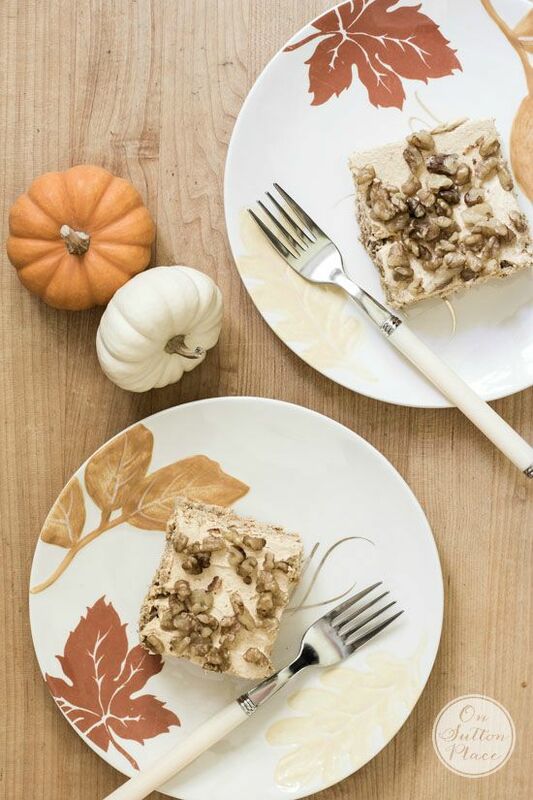 This pumpkin icebox cake recipe is easy to adjust and make your own. I tried this recipe the over the weekend and everyone went crazy over it. When I told them how easy it was, they all asked for the recipe! Your blog is a delight. Keep up the good work Ann. We all look forward to reading and trying all your recipes and ideas!!! Oh my I’m going out to get ingredients for ice box cake,yum. The cookies are a recipe I got from my mom,they are so good .Thanks for sharing. I can’t wait to try this recipe! Love pumpkin everything! ;0) I noticed someone asked about gluten free recipes and this recipe will work with substituting gluten free graham crackers! I’m also gluten free and it’s an easy substitution! 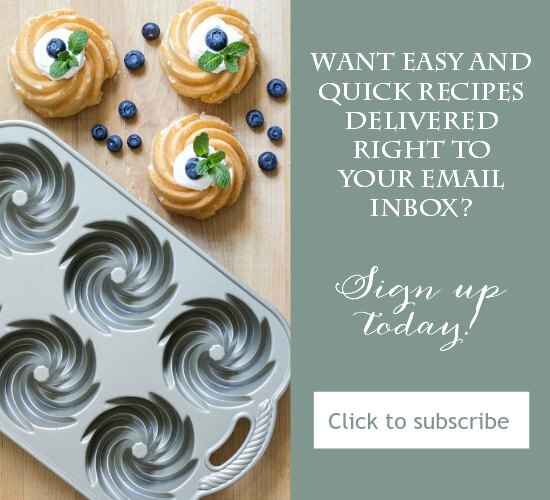 I love your blog and all your yummy recipes you share! Ann, first of all, I have to say I just love the pillow covers! Can’t wait to try this pumpkin recipe. I’ve joined the pumpkin wagon as well. In fact, I just baked two more batches of Chocolate Chip Pumpkin Pudding Cookies. I think this Pumpkin Icebox Cake will be perfect for my school’s carry-in luncheon. Thanks for sharing! This looks scrumptious! I have the same, worn measuring spoons. I have other newer, nicer ones but I always grab these first when I’m baking or cooking. I really enjoy your blog- it’s one of my favorites! I’m all over this one! Can’t wait to try it:D Love your new pillows, Ann! Everything is beautiful! The cake looks yummy, Thank you for the receips and the tip on the pillows . Hi Ann, I lurk here but rarely post – love your style girl! I am going to make your lovely pumpkin dessert for a church potluck. I’m sure it will be a hit and so easy to make. Thanks for the lovely blog posts, recipes, ideas, stylish pics. 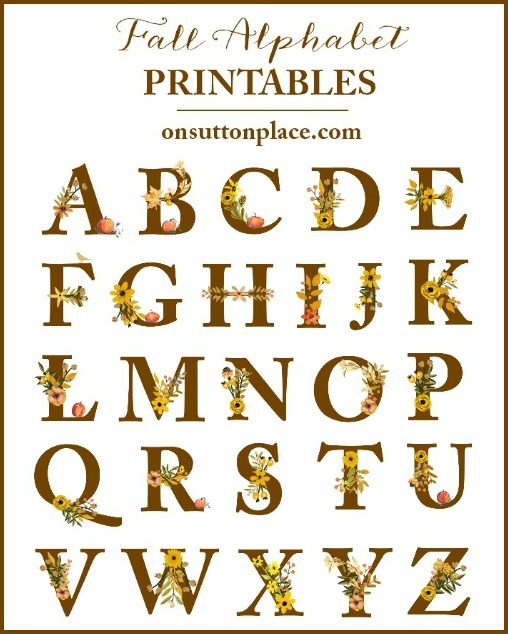 Happy Autumn to you!